Safety Technology International’s extensive range of fire and safety products continues to evolve with the latest addition to the ReSet Call Point line – offering a completely global solution. The UL listed Global ReSet features a versatile mounting plate which fits to US, European, double-gang and single-gang mounting box, allowing for a quick and easy installation. The Global ReSet mimics the feel of breaking glass without the need to replace broken parts, proving the benefits and environmental advantages of a resettable operating element. A real glass appearance maintains operator deterrence. When activated, the visible warning flag drops into view and is quickly reset with provided key for immediate re-use. The attractive device is available in five different colours and can be supplied in any language. 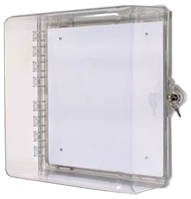 Protective covers with optional sounder are available for further protection against accidental or malicious activations. For further information, call Sales on +44 (0)1527 520 999, visit www.sti-emea.com or email sales@sti-emea.com.